Nowadays, it often seems our world is moving faster and change has become a constant. This applies to organizations and businesses also and affects their workforce: With the creation of new fields of work, come new positions to fill. With the evolution of technology, other areas of a business are on the verge of becoming irrelevant and the associated positions might disappear. In addition, thanks to globalization and digitalization, great distances are now so easy to overcome and companies expand – and merge and acquire – beyond borders. The question is: How can you manage organizational change and stay on top of workforce planning? How can you efficiently plan with new and old org units, and position your employees? We may have said it before but again it’s so true: Org charts are the answer. Naturally, the first thing that comes to mind when thinking about organizational charts is the visualization of hierarchy structures. Org charts give a great overview of where org units are located, which positions are clustered there, who fills these positions, spans of control, and so on. It’s all there in a nice overview. This shouldn’t be limited to the current state of your company hierarchy though. If your organogram offers a great overview of the present why not use it to form the structure of the future? Our org charting tool Ingentis org.manager offers a simulation feature that enables you to perform structural changes directly in your org chart. Model as many new structures as you wish to see what makes the most sense for your organization. And rest assured, simulated changes do not affect your core HR data – unless you end up with a solution that seems fitting. In that case, it’s possible to transfer the information to your data system. As mentioned above, organizational change includes the evolvement of the new and the loss of the old. This applies to all kinds of objects: Organizational units as well as positions and employees. In order to see how that looks, org.manager allows you to add new objects or delete them. What’s more, the software is able to calculate and visualize the KPIs linked to the respective objects to highlight the altercation’s impact. Are some new colleagues joining your HR department? Why not have a look at how this changes the headcount or average age of the org unit! Maybe, you are neither adding nor deleting objects. But still, there’s some change happening within your organization. Employees might be filling a new position, departments might have to be moved within the structure. 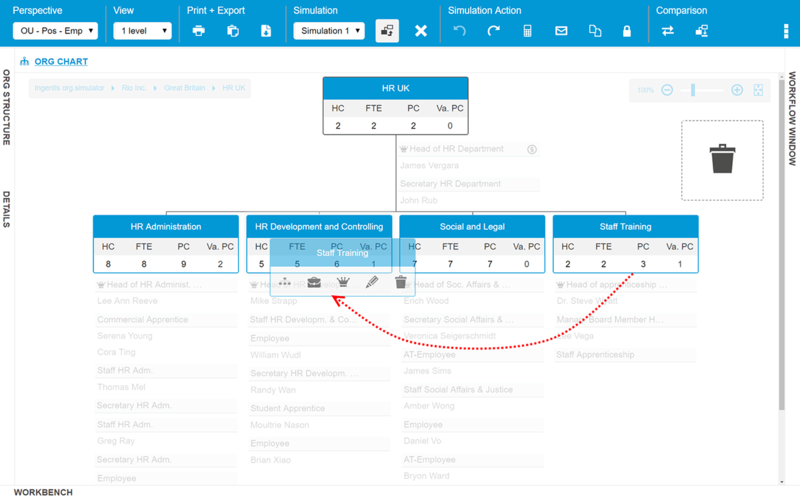 Use the org.manager simulation feature to move the respective objects around via drag & drop – it couldn’t be easier. Again, it’s possible to visualize KPIs and monitor the effects the moving of an object has on the rest of the organization. Merger and acquisition projects are rather challenging processes. Two companies with already existing org structures need to become one and this causes many questions: How can the “new” org units and employees fit in? Will every org unit of the “other” organization make it into the new structure? Who’s in charge of the newly merged org units? What to do with “double” positions? In a situation as complex as this, simulating several reorganization scenarios is essential in order to find the right answers. If we have struck a chord with you, and you’d like to learn more about organizational change performed with the help of org charts, check out our ​white paper “Organizational Change”, or learn more about the org.manager simulation feature here. Both will provide a great insight on how Ingentis org.manager can help you make informed decisions for your business based on simulations and models.